Pontivy is the capital of Brittany’s interior. It has a mixed history with a medieval centre built around the bridging point of the River Blavet. The crossing was guarded by the fortress like castle of the Dukes of Rohan whose fiefdom it was. When Napoleon built the Nantes to Brest Canal to protect his shipping from the marauding English privateers, he used Pontivy as a strategic supply port and his own western headquarters. It was thus renamed Napoleonville and as a reward for its allegiance to the new empire was redesigned with a strong military garrison. The broad main Rue National links the medieval quarter to the 19th century Napoleonic town. And from the Governers House above the town there is an impressive view of the large parade square surrounded by superb civic buildings to the old Cavalry Headquarters across the river. 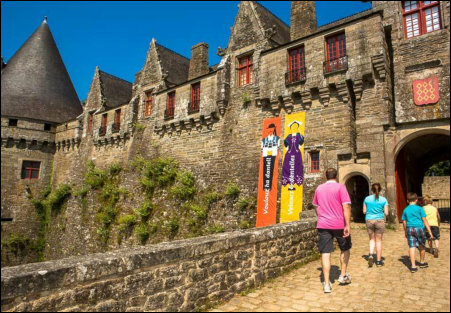 Today Pontivy is a thriving cultural and commercial centre with numerous restaurants, bustling shops and several music and dance festivals. 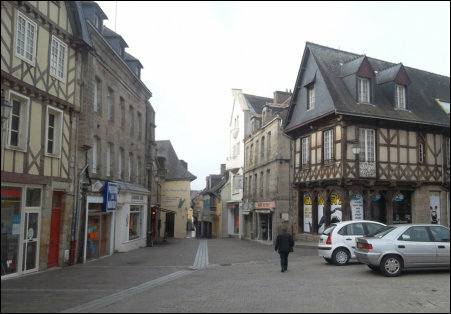 Pontivy has a good selection of shops, services and supermarkets and is less than 10 minutes from Lenvos. Our village of Cleguerec is just 5 minutes away and stands above the fertile Blavet valley surrounded by rolling farmland. It has bars and restaurants, a small supermarket, bread shops, butchers, banks and a pharmacy. It also has a doctor and dentist. As well as a sports stadium and tennis courts, it has a boating lake, 1 km fitness course and crazy golf. Cleguerec is also famous for Le Kleg, an annual Celtic music festival which attracts bands from all over Europe each May. Lenvos is only 10 minutes drive to the shores of the 1000 acre Lake Guerledan. 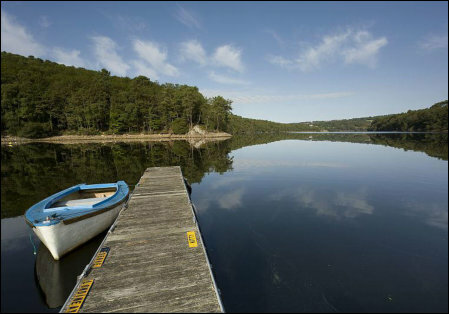 The lake is a jewel in central Brittany and is a centre for sailing, water-skiing, canoeing and fishing. There are several sandy lakeside beaches some quiet and used mainly by local children and others with small bars or restaurants. Water craft can be hired. The Lake is surrounded by the Forest of Quenecan, an ancient oak forest which was once used to fuel the 18C iron foundry (now open to the public). It is a favourite area for walking with hundreds of marked routes for all abilities. In the autumn the forest is popular with the locals who indulge in their passion for mushrooming.